Magnetic properties of micro- and nanoscale objects, are currently a topic of intensive research. Their investigation requires the development of appropriate tools, e.g. for detection of the magnetization reversal of individual magnetic nanoparticles (MNPs). Promising candidates for this task are strongly miniaturized superconducting quantum interference devices (SQUIDs) – so-called nanoSQUIDs. A SQUID consists of a superconducting ring, intersected by one or two weak links (Josephson junctions). SQUIDs are the most sensitive detectors for magnetic flux, and their sensitivity improves with shrinking size (inductance of the SQUID loop). As they enable direct detection of magnetization changes in small spin systems, that are placed close to the SQUID loop, nanoSQUIDs are very promising sensors for nanoscale applications. 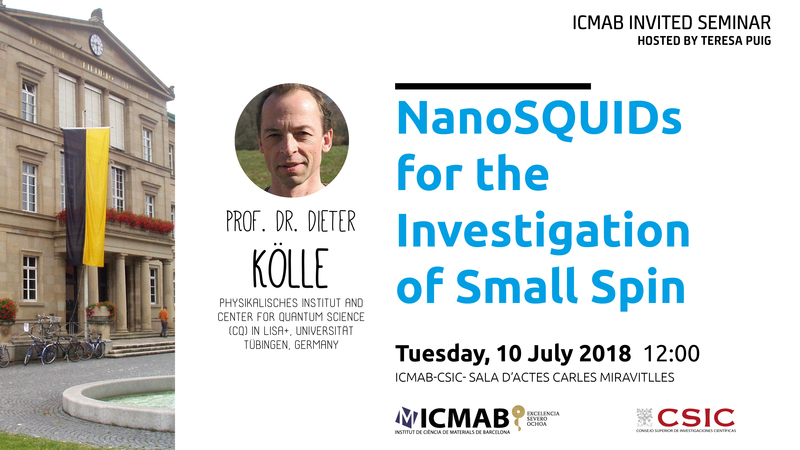 In this talk, I will review recent progress in the development and application of nanoSQUIDs, and I will present our approaches forb developing sensitive Nb and YBa2Cu3O7 (YBCO) nanoSQUIDs, which can be used for continuous measurements of magnetization loops of single MNPs in intermediate and strong magnetic fields up to the tesla range. To demonstrate the potential of such devices, we performed magnetization-reversal measurements, e.g. on a Fe nanowire (embedded in a carbon nanotube) and on single Co nano-pillars, which I will also discuss.